About a year and a half ago, a real loud-mouth got hired at my job and sat right behind me. I bought a box of earplugs at the pharmacy near the office, and started using them heavily. Then I started wishing I had them on-hand more often. I poked around, trying to find some kind of case I could keep them in when I found the True Utility Cashstash. It’s supposed to be used for keeping cash on your keychain in case you lose your wallet. It’s basically just a water-tight metal tube. Similar to keychain pill carriers, only smaller – the perfect size to keep a pair of ear-plugs in. They do get smashed a little inside, but they’re fairly easy to retrieve. I have found that if the plugs accumulate too much earwax (eww) one will stick in the Cashstash sometimes, but I can always pop it out with a key. The Cashstash comes with a little metal piece designed for the cash to be wrapped around. I just tossed that. 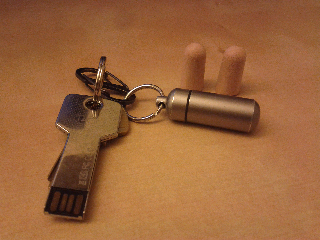 I carry ear-plugs with me everywhere I go now, and I am amazed at how handy they are. I have used them on the subway if I didn’t feel like listening to music. In long, loud lines. At concerts. My favorite place I’m always glad I have ear-plugs at hand is on airplanes during the electronic black-out periods.